24" x 30" mat, 1" squares on each side. 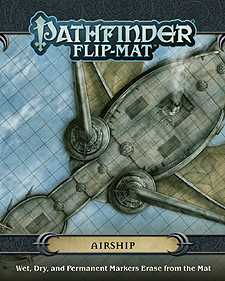 Soar into the wild blue yonder with Pathfinder Flip-Mat: Airship. Each side of the Flip-Mat features a view of an ancient, mysterious airship for players to fly - or bring down. One side displays a deck surrounded by a system of sails and propellers, while the other shows the deck of a dragon skyship with articulated wings and tail. This portable, affordable map measures 24" x 30" unfolded, and 8" x 10" folded. Usable by experienced GMs and novices alike, and friendly to both dry erase and wet erase markers, Pathfinder Flip-Mats fit perfectly into any Game Master's arsenal!